We started introduce puree when my son is 5 month old. 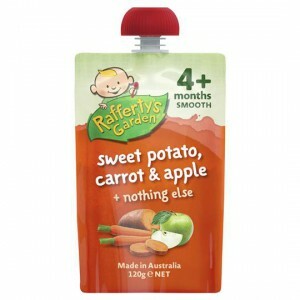 Rafferty’s Garden is one of the baby food brand we stock up in pantry. It’s very handy when we out and he like the taste of it. Had used this Rafferty garden food when my bub was 5+ , he usually likes all the flavours. This pre prepared food had saved my life when I am in hurry. I cant live without these!! My son has been very fussy, and these are one of the few that he really loves! It made those fussy times really easy! When you have an icredibly fussy child who is just impossible when it comes to vegetables these SAVE THE DAY! Oh so much guilt when it comes to not being able to get your child the vegetables they should have and then Raffertys comes along and fixes everything. Never fear – you will get there but in between feed your child these! I love Raffety’s Garden pouches and this flavour is no different. I always a few of these put away for when I’m out and about or shopping as it makes great snack. My son loves this sweet potato and carrot flavour. How would you rate Rafferty’s Garden Food 4 Months+ Sweet Potato, Carrot & Apple?